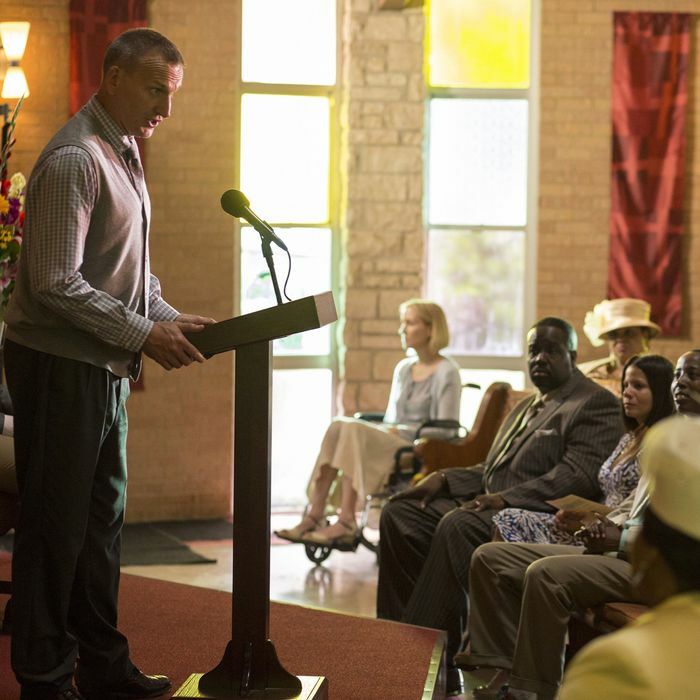 After an intriguing origin prologue, last night’s season opener of The Leftovers resettled us in Jarden, Texas, rechristened “Miracle” when none of its town’s 9,261 residents were affected by the sudden departure three years earlier. Now a national park replete with its own rules, Miracle is home to the seemingly normal Murphy family who, like the Garveys of Mapleton, are each trying to find their way in the transient new world. Of course, a show dealing in all things theological needs its own spiritual guidance. So religion writer and future TV personality Reza Aslan, a Harvard Divinity School grad, has come on board to help craft the story for season two, and consult on all matters of faith. He says we’d better get comfortable with the show’s ambiguity because that’s what religion is about, though we can expect lots of clues to help frame the central mystery. Still, those looking for specific answers take heart: Aslan says we’ll get “all the material necessary to draw our own firm conclusions about what happened.” Ahead, more of his divine insights into episode one. What’s the significance of the prologue, which takes place in the same spot that becomes Miracle? The episode is called “Axis Mundi,” an ancient thought that goes back thousands of years. The idea is there are parts of the planet that served as a cosmic pole around which the entire universe circles. So for instance, the pyramids at Giza, the temple in Jerusalem, the Kaaba in Mecca are axis mundis. What’s really remarkable about an axis mundi is that putting something sacred there is not what makes it sacred. It’s that the land itself was already sacred for some mysterious reason, and that’s why people put something there. Jarden is an axis mundi. To indicate that, Damon [Lindelof] came up with this clever prologue, which will of course pay off in subsequent episodes. The inherent sanctity and magic of this place — whatever it is — is an eternal thing. It’s not just something that happened at the sudden departure. Is there a parallel between the Eve-like woman in the prologue whose baby is rescued by another woman, and Nora finding Holy Wayne’s baby on the Garvey’s doorstep? Very much so. Everything that happens, the symbolism, is quite deliberate. You should read something into everything you see. Let’s talk about the Murphys. John, the fire chief, and his crew punish Isaac, the psychic he thinks is taking advantage of people. The Murphys are fascinating because they represent the different ways one family deals with the departure. You have Michael, who’s a very devout Christian, struggling to make sense of what happened, and to figure out a way to integrate it into his current belief system. You have John who has absolutely rejected any conception of the supernatural or of faith. He’s a man of pure reason — so radically so that he reacts with anger and violence against anyone who claims otherwise, as we saw with Isaac. Then you have Evie and Erica. Evie we’re not sure about just yet. Erica is walking this fine line between John and Michael. They represent the sort of primary ways in which any kind of preconceived notions people had before the sudden departure become crystallized. You would think that in the wake of an event like this people would either go from being believers to becoming nonbelievers, or go from being nonbelievers to believers. But instead what happens is that you double down on your current belief system. You find solace in it; you anchor yourself to it as much as possible. Isaac predicts something bad is going to happen to John, who brushes it off. But when he drops his spoon down the sink disposal, he’s afraid to stick his hand in to get it. He’s superstitious after all. You got it perfectly. The most absolute believer has in the back of his mind, in secret, doubt. And that’s true for the most fervent unbeliever as well. In the post-departure world, there is no such thing as absolute certainty. It just doesn’t exist. What’s the deal with the mysterious chirping in the Murphy house? When Erica goes jogging, she digs up a box in the woods and releases a chirping bird. Then she goes home to find John listening for the bird and tells him he’s not going to find it. What John hears is a cricket. I can’t really say anything about the bird, and I can’t really say anything about the cricket! Then there’s Evie and her girlfriends romping naked through the woods. Is this some pagan ritual? Nope, it’s just girls romping in the woods. There’s deliberate symbology there that’s supposed to have the same kind of metaphoric feel that you have from the opening scene: The idea of frolicking in the wilderness in an Eden-like place. It’s definitely there for a reason. Matt’s wife Mary’s condition seems to have improved since they moved to Miracle. He starts to say something about her at church and is cut off by the preacher, whom I assume is protecting him from John. Matt is absolutely and utterly convinced there is something miraculous about Miracle, and he has a reason to think that way. And yes, that’s a correct interpretation. What’s the deal with Jerry? Everyone in the café looks on when he sacrifices a goat in the middle of the restaurant! There are these things all over the city that are a little bit hard to explain; they’ll get explained later. But one is this idea among many residents that they were saved [because] there was something special about them. So there is an attempt to constantly repeat everything they did on that day. That’s actually a common occurrence among religions. On the day of the departure, Jerry suddenly appeared in the city without explanation and sacrificed a goat. And of course people were horrified. Then the departure happened, and so they now kind of give this guy free reign. Everybody is too afraid to do anything about it. Michael brings meals to the strange dude living in the tower in the town square. What’s his story? This is a very old tradition: the recluses who go up in high towers. You can actually see this in paintings from the thirteenth and fourteenth centuries. They go up in towers, and in Eastern tradition, they’re ascetics renouncing the world with followers or residents feeding and clothing them. They’re there as testimony to the illusion of reality — Eastern tradition — or as a monastic separation from society — Western tradition. He’s one of the people who, in the months after the departure, descended on Jarden. If you were there before it became a federal territory, you got to stay. The episode ends with an earthquake similar to the one in the prologue. And we’re back in the same spot as the watering hole, which is now bone dry. What’s the significance? Also, has the psychic’s prediction come true? There is an earthquake, and the water does go bone dry, but I don’t think I can explain just yet. The truth of Isaac’s prediction is up to the viewer. There’s a lot more show to go, so maybe there’s something else he was talking about. John’s trajectory is going to be very dramatic and interesting. We’ll have more of Aslan’s insights after next week’s episode.